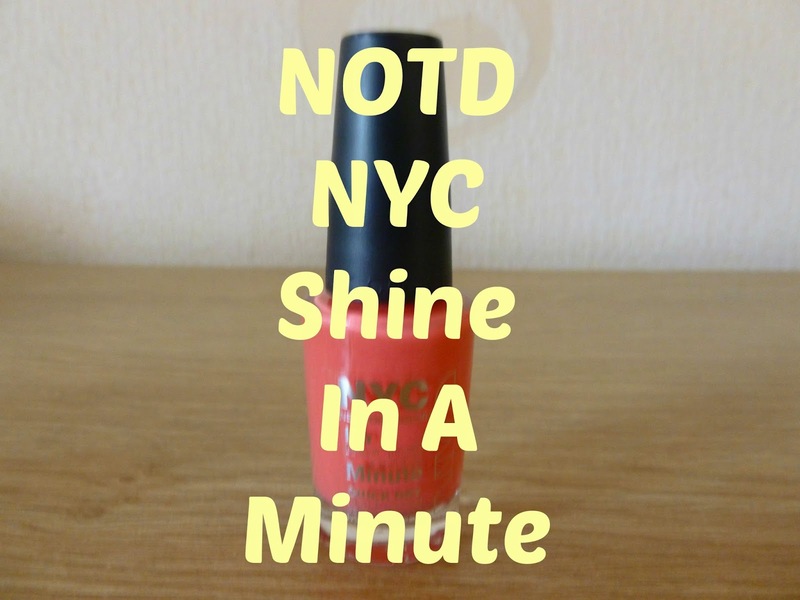 Today I have another NOTD post for you, todays NOTD is the NYC Shine In A Minute nail polish in the colour Spring Tulip. I love nail polish and if you're a regular reader of my blog I'm pretty sure you're aware of that by now and in the spring and summer months my go to nail colours are corals and pinks, anything from pastel to neon I love corals and pinks for spring and summer and today's NOTD choice is no exception. Two coats of Spring Tulip with one coat of Orly Glosser top coat. I applied 2 coats of the nail polish allowing each coat to dry fully in between, the polish does as it says on the bottle and dries quickly, and once dry I applied a coat of my holy grail top coat, the Orly glosser top coat. 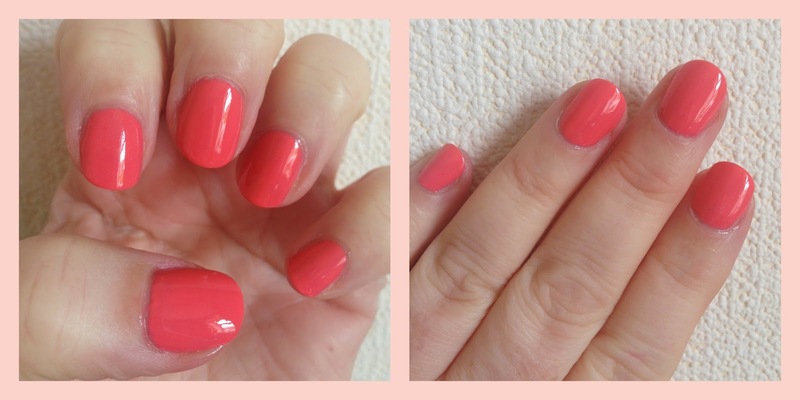 Spring Tulip is a really beautiful coral colour and was opaque in 2 coats, it was easy to apply and the brush is a standard nail polish brush, as the name suggests the polish has a great drying time meaning no waiting around and hand flapping or blowing on my nails, does anyone else do that? I got 4 days wear time from this without chipping and it chipped on day 5 not bad at all I'd say. 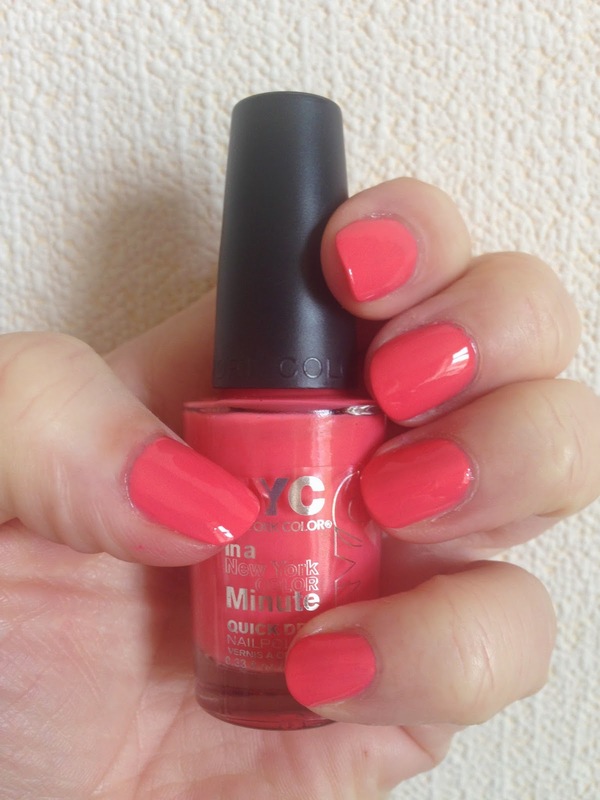 I love this polish, it is the first NYC nail polish I have ever bought and the purchase was completely enabled by my lovely friend Gemma and I'm so glad I took her advice and purchased it, aside from the polish being a beautiful coral shade and one that is perfect for the spring and summer months another great thing about this polish is the price, this polish was just £1.79 there are some beautiful colours in the range and I will definitely be picking up some more, theres a gorgeous bright pink and a pale blue I have my eye on but there are lots of lovely colours and most definitely something for everyones taste I'm sure. If you would like to try Spring Tulip and I highly recommend you do, you can buy it on line from Superdrug for £1.79 and currently on 3 for 2 which is even better! And if you'd like to try the Orly Glosser top coat you can buy it here for £10.90 and there's free delivery if you spend over £15. What's your go to spring and summer nail polish shade or shades? Have you tried the NYC polishes?